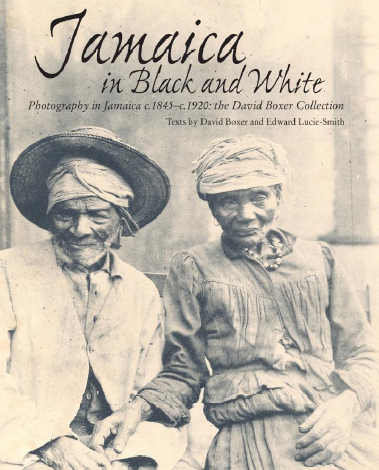 Photography in Jamaica c.1845-c.1920: the David Boxer Collection. The sixteen sequences in this remarkable book display the changing landscape and the built environments of Jamaica, the principal agricultural industries, and the Jamaican people. In the section titled ‘Picturesque Jamaica’, the ravishing beauty of the island captured by nineteenth century practitioners is abundantly evident in breathtaking vistas of the famed tropical paradise, which Christopher Columbus described as ‘the most beautiful island that has yet been seen’. Jamaica’s post-emancipation history is reflected in rare photographs of sites, personalities and events surrounding the so-called Morant Bay Rebellion of 1865, which form a significant sequence, as does the poignant penultimate section, which deals with the destruction of Kingston in the earthquake and fire that ravaged Jamaica’s capital in 1907. The final sequence, which shows a new Kingston being rebuilt and developed, is a moving tribute to the resilience of the Jamaican people. This fascinating collection clearly demonstrates that historic photographs can be used as a sharp-edged historical tool, to analyse the evolution of what is now one of the most fascinatingly complex and vibrant societies in the world. David Boxer, the Director Emeritus and veteran Chief Curator of the National Gallery of Jamaica, has, during the past thirty-five years, curated over a hundred exhibitions charting important aspects of Jamaican and Caribbean art history. Dr Boxer has always taken a keen interest in the history and development of photography. About twenty years ago he embarked on a thorough investigation of the use of photographic media in nineteenth and early twentieth-century Jamaica and began to put together a personal collection which forms the basis for this book. Dr Boxer is now engaged in assembling a collection of twentieth century Jamaican photography. Edward Lucie-Smith is an internationally renowned art critic and historian with more than a hundred books to his name. He has acted as curator for many exhibitions and lectured extensively all over the world.